The Citra hops profile should scream citrus, at least based upon it’s name alone. Citra is one of the most sought after aroma hops, and with a strong citrus profile of grapefruit, orange, and other tropical fruits it’s easy to see why. If you’ve read any of my previous BrewGrounds, you know I’m a citrus fanboy. In my continuing endeavor to play around with flavor and aroma profiles using different hops in my beers, I thought this would be an ideal opportunity to see what flavors and aroma I could coax out of Citra hops. This BrewGround will only use Citra hops, as a bittering, flavor, and aroma addition, to see what impact that hop would have on flavor and aroma for a beer I brewed. Again, the simple goal being to educate myself on the Citra hops profile, and determine if this was something I would use again in a more complex beer. Citra is a dual purpose hop, and can be used for bittering as well as flavor and aroma. Although it’s primarily considered a flavor/aroma hop, as it’s bitterness can be a bit too much for some brewers. Citra was released in 2007, and has a rather complex lineage that includes the likes of Hallertau Mittelfruh, US Tettnanger, East Kent Goldings, and Brewer’s Gold. Citra’s high Myrcene Oil content gives it that citrus punch we all know and love. Citra hops are known to give off major fruit characteristics which lead to aroma and taste of grapefruit, orange, lime, mango. This BrewGround was created with a rather simplistic Pale Ale recipe, using a majority of Pale Ale malt, with a small kicker of Vienna for flavor and Cara-Pils for some added body. I didn’t want the malt taste overpowering the Citra hops profile. I whipped up a small 1.2 gallon batch, using my standard BrewGround process, and was able to hit an efficiency of 70%. After 7 days of primary fermentation at 65 degrees, I ramped up the temperature to 69 degrees for another 4 days. I typically don’t cold crash or fine my ultra small batches with gelatin, and I followed that same process for this Citradelic Pale Ale. I beat my target FG by a few points, which ended up at 1.009, with a measured attenuation of almost 82%. Love using Safale US-05 for these small batches, as it’s just so damn easy to use. After fermentation was completed, I racked to a bottling bucket with priming sugar, and bottled 8-16oz Grolsch bottles. Note the difference in clarity in the beers below. 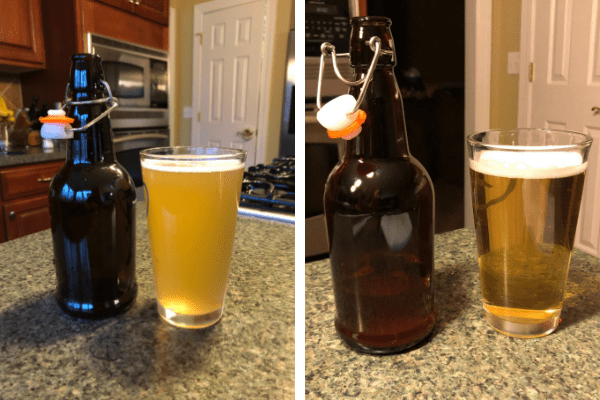 The beer on the left was conditioned for approximately 3 weeks, while the beer on the right was conditioned for 6 weeks (3 of which were refrigerated). Keep in mind this beer was not fined with gelatin. This was a very good beer! In fact my wife who isn’t a huge beer drinker commented that this was my best beer to date. I’ll take that compliment. Perfect malt taste balanced nicely with the Citra hops. I’ll give myself an A. So enough about the beer, what about the Citra hops profile? Imagine this. Cut a ruby red grapefruit in half, give it a gentle squeeze to release some juice, now take half of that grapefruit and give it a big smell. Huge citrus aroma right? That’s exactly what I got from this Citradelic Pale Ale. It screams citrus, specifically grapefruit. I may have got a hint from some other citrus elements, but nothing that I was really able to distinguish. I smelled loads of grapefruit, and I really liked it. Keep in mind, this beer was not dry hopped, although I did add a hop addition at flame out. I can only imagine the aroma dry hopping would impart using Citra hops. I seem to always be struggling when it comes to picking out flavors in beer, especially when it comes to hops. That wasn’t really the case with this Citradelic Pale Ale. While the aroma screamed grapefruit, my taste sensations were also able to pick out citrus. It wasn’t a bitter grapefruit taste, but rather a stronger citrus taste with hints of grapefruit thrown in. While my recipe clocked in at 36 IBU’s, this wasn’t a bitter beer at all. The malt and citrus hops blended together in unison, the sweetness of the malt offset by the hop bitterness. Since I’m just getting into picking out aroma’s and flavor’s in the beers I brew, I’m not always the best person to evaluate these things. What if I gave my Citradelic Pale Ale to a few unsuspecting bystanders? Would they be able to pick out the grapefruit aroma and taste that I was getting? I put it to the test. All three of my testers identified a citrus aroma. One of them, without hesitation, said it smells like a grapefruit. The other two weren’t really able to distinguish a particular fruit from the aroma. When it came to tasting, again all three concluded a citrus taste. While none of the three, made the leap to a grapefruit taste, they were definitely tasting citrus. I’ll spare the charts for this particular BrewGround. All four testers of this beer came away with citrus aroma and taste, and weren’t able to pick out any other distinguishable characteristics. Would I Use Citra Hops Again? I would absolutely use Citra hops again for both aroma and flavor additions. In fact, I can’t wait to try Citra paired with other hops in a beer. Pretty much any Pale Ale, IPA, or NEIPA would be a great fit for a late addition or dry hopping. The result of this little exercise to understand the Citra hops profile told me to stock up on these bad boys. I definitely want these on hand for future brew days.